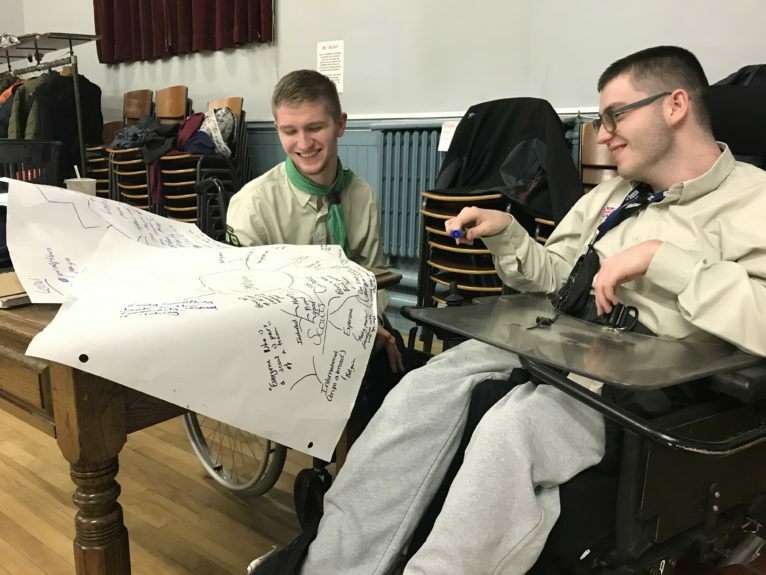 This week it’s the turn of Michael Love and Ross Proctor, who tell us about the importance of scouting in how they view their community. There were lots of ideas, but most of us struggled to identify our local community by where we live, which is what we started off thinking about. Then we realised, community just means a group of people with something in common. Easy! Both of us have been Scouts since we were eight. We’re now in our twenties, so that seems like a long time ago! We’re still enjoying being part of the community that is Scouting. If we stopped people on Buchanan Street and asked them if they had heard of the Scouts most people would probably say yes. But we don’t think they could ever really understand how much people like us get out of being members of this organisation. For us, this community has brought us lifelong friendships, widened our horizons and built up our confidence and independence. We’re part of a community that doesn’t believe in “you can’t do that” but rather, “okay, let’s figure out how we’re going to do that”. We’ve abseiled down rock faces, sailed across lochs and been abroad twice. These experiences have taught us an important life lesson – you don’t always have to do things the same way as everyone else to be able to do them. We find our own way, maybe taking twice as long (what’s the rush all the time?) and we have a lot of fun doing it. At a time when, let’s be honest, your local community doesn’t always seem like much of a community, being part of Scouts has made us less lonely, less isolated and has introduced us to people from all different backgrounds. When there’s a lot about social isolation in the news, we have a sense of togetherness. The final thing that is important to us is that through Scouts we’ve been able to give back to our community. We help out with the younger kids, we share our expertise in how to make things more accessible (we’re available to consult, on request!) and we help other community groups and individuals whenever we can. We always feel there is a bit of a perception that disabled people take out of the community, and don’t put anything back in. We want – no we need – to challenge that idea. We contribute too, just like everyone else. We always feel there is a bit of a perception that disabled people take out of the community, and don’t put anything back in. We want – no we need – to challenge that idea. We’d love to tell you more about it now, but we’ve got a three-course meal to cook on a gas camping stove and a game of hockey that isn’t going to play itself.